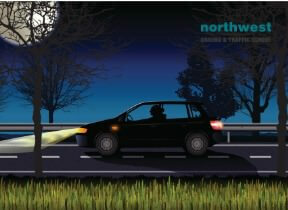 Your car’s exterior lamps can cause unintentional discomfort for other road users. Learning how to use them responsibly is all part of learning to drive, especially during the darker winter month. The following five tips will help you reduce the chances of you using your lights in a manner that discomforts other road users, which, in turn, might also reduce the risk of an incident occurring. If you find yourself sitting stationary at traffic lights, it is important that you are aware that leaving your foot on the brake pedal will mean the driver behind is absorbing the direct output of three bright lamps directly into their retinas. Certain weather conditions can make this effect wrose can make this situation worse. Rain can increase the dazzling effect as the droplets reflect the light source and fog can diffuse the light over a wide area, making it difficult for drivers behind you to see oncoming traffic. If you drive an automatic, or a single clutch automated manual, try to avoid putting your vehicle in ‘Park’ when you are stopped momentarily on the main road. Putting the vehicle in Park will cause the reverse lights to illuminate briefly, which might cause the driver behind to think that you are about to reverse suddenly. Instead of putting your vehicle in park, try to engage Neutral instead. This will prevent the reverse lights from illuminating. Should your car be fitted with daytime running lamps (DRLs), remember that they can dazzle oncoming motorists when they are used in conditions in which dipped headlights would be more appropriate. Daytime running lights are should be with either turned off or dimmed automatically, when your car’s main lamps are activated. Many models of car do not automatically have their rear lamps illuminated while their daytime running lamps are activated, meaning they are not always the best choice for making your vehicle visible to other road users. It’s also important to remember that, just because your illuminated dashboard dials come automatically, that does not do not mean that the appropriate exterior lights for the weather and road conditions have activated. It’s important that you exercise your own judgment, rather than relying on automated systems. Never fit LED or HID upgrade bulbs to any exterior halogen lamps. Not only are they illegal to use on the road but headlight conversion bulbs, both HID and LED models, are more likely to dazzle oncoming motorists, thereby rendering your car unroadworthy and potentially causing an accident. If you do want to fit additional lighting to your vehicle, it is important that you make it conforms with the general road rules and any additional rules applied by whichever state you are in. Seeking the advice of a qualified mechanic before making upgrades to your car’s lighting is always a good idea. If you find yourself driving at night and you are carrying several passengers in your vehicle, or a particularly heavy load in your trunk, your headlight beam aim is going to rise as the rear suspension is compressed. Most models of vehicle have a manual control that you can use to lower the beam to compensate for the change in ride height, just don’t forget to return it to its original setting after your car is unloaded again.